Hannibal, MO – Hannibal-LaGrange University held the 70th annual Booster Banquet on Tuesday evening, November 15. The featured guest speaker was former Arkansas governor, Mike Huckabee. Huckabee is the host of the number one rated “Huckabee” on the Fox News Channel, and is heard three times daily across the nation on the “Huckabee Report” syndicated by the Citadel Media Network. It has been the fastest growing new program on the Citadel Media Network in recent years. He is the author of seven books, the most recent being A Simple Christmas, which was a regular on the New York Times Bestseller list for weeks when it was released. After his campaign for the Republican nomination for President in 2008, in which he finished second to John McCain, he formed HuckPac to assist conservative Republicans running for office nationwide and has amassed a volunteer team with thousands of activists in all 50 states. 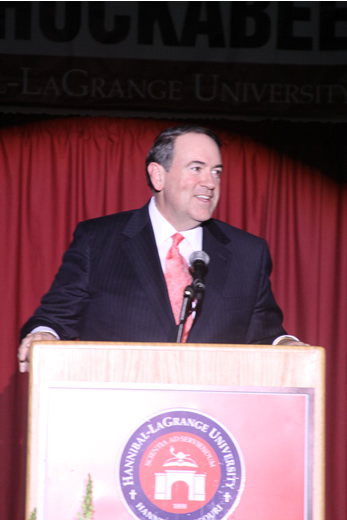 From 1996 to 2007, Huckabee served as the 44thGovernor of Arkansas and was recognized nationally for his leadership, having been honored by several renowned publications and organizations for his numerous accomplishments. Governing magazine named him as one of its Public Officials of the Year for 2005, Time magazine honored him as one of the five best governors in America, and later in the same year, Huckabee received the American Association of Retired Persons Impact Award. The former governor and his wife, Janet, live in Florida. They have three grown children: John Mark, David, and Sarah. The evening began with special music by the HLGU Brass Ensemble, followed by the singing of the HLGU Alma Mater, The Scarlet and The Blue, directed by John Booth, chair of the HLGU Music Department, and accompanied by Karen Meade, music department assistant. Pat Benson, chair of the trustee executive committee, gave the invocation, and Dr. Woodrow Burt, HLGU President, welcomed the guests. Following the meal, Charles Brazeale, trustee, issued a challenge called One of a Thousand, which entails finding one thousand people to donate $500 to purchase furnishings for the new Roland Library (scheduled to be completed spring 2012). For more information or to make a donation, please contact the HLGU Institutional Advancement Office at 573.629.3120. Dr. Burt then thanked all who helped with the event, and introduced special guests, including current and former trustees, Judge Rachel Bringer, Missouri Senator Brian Munslinger, State Representative Lindell Shumake, newly elected Executive Director of the Missouri Baptist Convention Dr. John Yeats, Dr. Earl E. Roland, alumnus and friend of the university who made the lead gift on Roland Library, among other projects, and Rheyma Carroll and the late Kenny Carroll for their generous donations to the university. 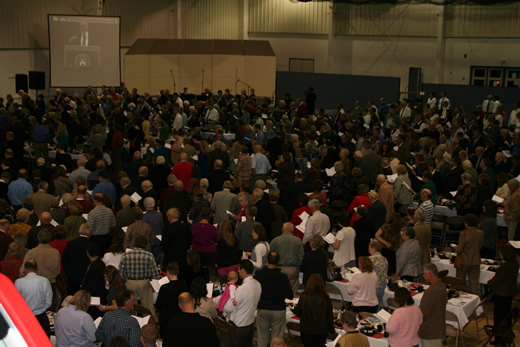 Dr. Burt also acknowledged the growth in enrollment in recent years, and awards including being named one of America’s Best Christian Colleges and Best College Scholarships by Institutional Research & Evaluation, Inc. HLGU was also again recognized as the number one university in the nation for missions mobilization. 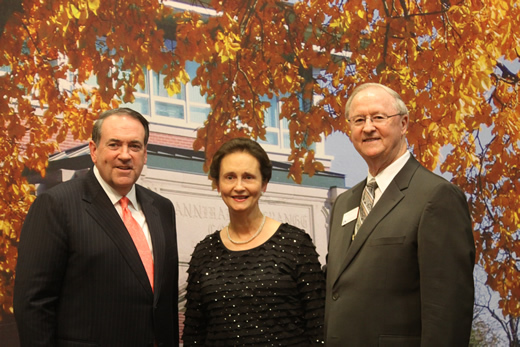 Dr. Burt went on to introduce guest speaker Mike Huckabee, followed by a performance by the HLGU Concert Choir, directed by Jane Griffen, assistant professor of music. Huckabee spoke on the power of the words “Do unto others as you would have them do unto you.” He pointed out that just as his mother had made that a motto in his life, the world would be a better place if everyone abided by that one basic rule. Keeping the focus off of politics, Huckabee simply stated that it has nothing to do with democrats and republicans; it has to do with moral and immoral. The evening was closed by the singing of It is Well with My Soul, and a benediction by Reverend Terry Buster, chair of the Board of Trustees. The 71st annual Booster Banquet will be held on Friday, November 16, 2012. For more information, please contact Lauren Youse, alumni director, at 573.629.3126.